THEY lack the magic of “Harry Potter” and provoke even less laughter than “Police Academy”, but the sequels keep coming. In Santiago on November 28th and 29th the committee of central bankers and supervisors from nearly 30 countries that draws up global bank-capital standards is due to thrash out revisions to Basel 3, the version agreed on after the financial crisis of 2008. European (and some Asian) bankers and officials fear additional capital requirements are coming; Americans are all for the changes. Stand by for a standoff in Chile. Spurred by Basel 3, banks have stuffed billions into capital cushions that the crisis showed to be woefully thin. Between mid-2011 and the end of last year, 91 leading lenders bolstered their common equity by €1.4trn ($1.5trn), or 65%, according to the Bank for International Settlements (BIS), which provides the Basel committee’s secretariat. The ratio of equity to risk-weighted assets, an important regulatory gauge, climbed from 7.1% to 11.8%. Although Basel 3 need not be fully honoured until 2019, most banks are far above the minimum of 4.5% (additional buffers, some at national level, raise the actual floor much higher). But the committee has been taking a closer look at banks’ calculations of risk-weighted assets. It has concluded that banks’ internal models vary too much: in an exercise in 2013, in which it asked 32 lenders to assess the required capital ratio for the same hypothetical credit portfolio, the highest answer was four percentage points above the lowest. Some banks, it believes, are too sanguine about credit risk. Where banks’ own models are used, it wants minimum values for important parameters, such as the probability that loans go bad. And it is considering an “output floor”—a lower bound for the risk-weighted sum of their assets—of 60-90% of the figure calculated under a “standardised” method. Supervisors and ministers have said that the changes should not “significantly” raise “overall capital requirements”. But some lenders can expect an increase. The proposed standardised approach, for instance, weights residential mortgages worth 60-80% of the value of the property at 35%: in Denmark or Germany, say, where defaults have been rare, banks’ models imply little risk and lower weights. When loans of all sorts are totted up, several internal calculations of risk-weighted assets are likely to be below the output floor. Substituting the floor for the internal figure boosts risk-weighted assets, depressing the capital ratio. Analysts at Morgan Stanley estimate that global, non-American banks could see risk-weighted assets rise by an average of 18-30%, depending on the level of the output floor. Extra capital of €250bn-410bn could be needed, a tall order when earnings are thin and investors wary. The committee’s reviews of operational and market risks would add even more. European banks complain of being forced into an American-designed straitjacket. Higher capital requirements, they complain, will crimp lending and growth—although research by the BIS suggests that better-capitalised banks have lower funding costs and lend more, not less. American banks will be little affected by the credit-risk proposals. They sell most mortgages to Fannie Mae and Freddie Mac, two government-owned entities, whereas European lenders keep them on the books; American companies borrow from markets rather than banks. 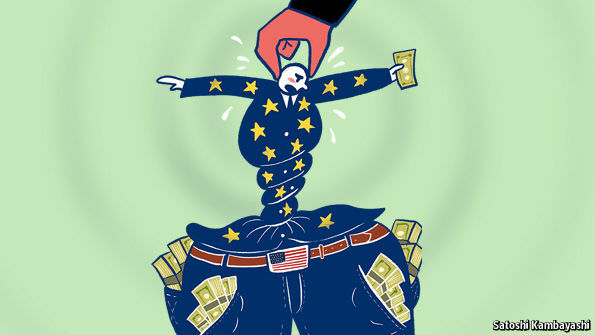 Americans retort that their post-crisis supervision has been stricter than in Europe and that they were quicker to knock themselves into shape. There may be some wriggle room. Banks may be given more flexibility in using models for corporate and specialised lending. Rather than apply the same rules everywhere, Europe’s supervisors could adjust them for local conditions: Swedish banks must already weight mortgages at 25%. A long phasing-in period may also soften the impact. But a tricky two days lie ahead. No one dares mention Basel 5.